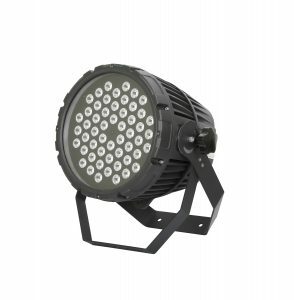 Single colour and endless mixing effects in all-weather fixture PR Lighting’s new XPAR 354 (PR-6209A) fixture is an IP67-rated par light for external use. Equipped with 54 x 3W LEDs, it provides RGBW (with amber and lime options) as well as single colour output to deliver countless mixing effects and combinations. This makes it ideal for multi-scale outdoor stages, theme parks and so on. Included in the comprehensive feature-set are electronic linear dimming from 0-100% and electronic strobe, from 0.5-33fps. It also offers variable beam angles (half peak) 9°, with options of 7°, 10°, 20° and 40°). Other functions include Lamp board and fixture usage time display; DMX channel mode and setting display, and LCD menu display (backlight automatically turns off after a delay). Control mode and other information can be transmitted via synchronisation. Housed in a high tensile, cast aluminium IP67-rated alloy chassis, the weight of the XPAR 354 is just 10kg.